« Too Much Stuff, Not Enough Space? Shelving, Inc recently completed an installation of a modular in plant office for Oakland University in the O’Rena Athletic Center. The O’Rena Athletic is the center that hosts the Oakland University women’s and men’s basketball games as well as gymnastics, dance, cheerleading and other sporting activities at the university. 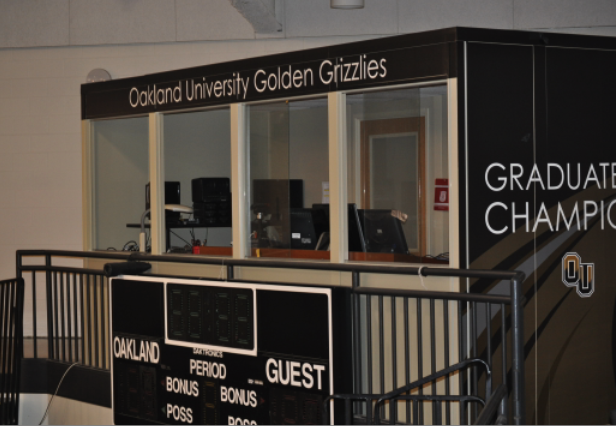 The Golden Grizzlies utilize the office to broadcast and record the various sporting events that are held at the O’Rena. The office provides sound protection and a commanding view of the sporting event. For more information about Oakland University’s Athletics visit http://www.ougrizzlies.com. Our team of installers completed this project on time and within budget. If you have a need for a modular office feel free to contact us. We can provide complete design, engineering, electrical, mechanical and installation services for a turn key project. We’re happy to be a proud sponsor and vendor for the Golden Grizzlies and we’re delighted to be of service for all our past, present and future customers. This is really useful. Cheers. This is Fantastic. Much Appreciated. Enjoyed your post. keep it up. this blog was very intresting to read, and it has alot of helpful infomation in it.